What better way to learn the game, than to read how other people play. Rob Carl died on Tuesday, September 25, 2018. Mike has compiled a tribute to Rob based on the memories of other A World at War players. This is not exactly a game report, but since life is really one long game it seems appropriate to place it here. Given the positive impact Rob had on the people around him, I would say that Rob won that game. This year’s A World at War event at the World Boardgaming Championship saw twenty-six players refighting World War II in six A World at War games, a significant increase over last year’s turnout. Three of the A World at War games began from starting positions arising out of Gathering Storm, GMT’s companion prequel game which begins in Spring 1935, and three of the games were ‘classic’ games of A World at War. Two of the Gathering Storm games were played before the convention by e-mail and the third was courageously played on the first day of the convention. After Action Reports (AARs) were written by the players from several of the games. Those AARs are posted here for your enjoyment. Like he did two years ago, Elihu compiled and edited interviews from five of the seven games at the 2013 WBC (World Boardgame Championships) in Lancaster, Pennsylvania. The interviews were taken at several different points throughout each game and so reflect each player's views on how their game is progressing. Elihu compiled and edited interviews from all of the players in each of the eight games at the 2011 WBC (World Boardgame Championships) in Lancaster, Pennsylvania. This was a European Scenario game that was played until the Fall 1942 turn, when time ran out. Every year at the WBC (World Boardgame Championships) in Lancaster, Pennsylvania a group of AWAW player gather to play an entire game in about 5 days. These files provide a description of the last eight years and the games that were played. 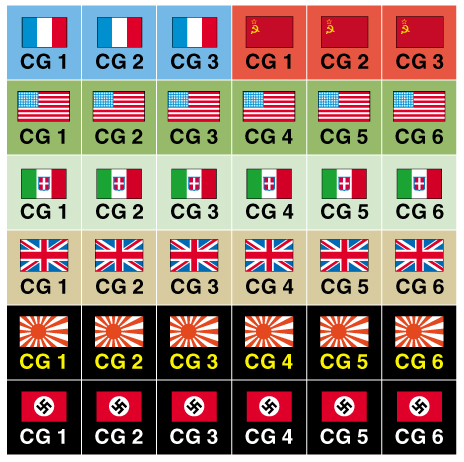 This was a Global Scenario game that was played from Fall 1939 until the Spring 1944 turn, when time ran out. This was a European Theater only game and was the newcomers' game at the MiniCon. This game lasted from Fall 1939 to Winter 1942. The players' lack of experience slowed the pace of play considerably. Eric Thobaben & Raf De Backer Here is a game report up to the 1943 YSS. It is being played by Eric T (Allies) and Raf De Backer (Axis) via Warplanner. Pearl Harbor - Example of Play Eric Thobaben & Raf De Backer Here is a Pearl Harbor attack example of play. Casper Game Report Dave Casper Dave has have posted a (partial) report on a European campaign game in progress between Pablo Garcia (Axis) and Dave Casper (Allies). The report includes Warplanner screenshots, a fairly detailed narrative, player comments, and all RP/DP allocations. This is the first AWAW game played by Pablo, while Luis has a large playtesting experience on the system. The game started in September of 2003 and is being played (from Santiago and Buenos Aires) by email using Warplanner 2. Currently both players are involved in other PBEM games. What follows is an Axis/Japan view of the war, up to the summer of 1942. The focus is on military developments, while research and diplomatic details are highlighted only when necessary. The Euroaxis general strategy has focused on naval research and sub/raider warfare (borrowing heavily from the recent ULTRA article on sub warfare), while large amounts of DP s were poured into USAT and RGT. The Empire of the Rising Sun follows a rather "learning by erring" plan, only belatedly seeing the pointers on the yahoo-list (highly recommended). The experienced Allied player has graciously allowed the correction of many blunders stemming from the yet-incomplete grasp of the rules by the Axis player, and has displayed a cold-blooded determination to fight the Axis in the proper occasions early in the war. Eric Thobaben, Eric Scheulin Here is a Coral Sea detailed example of play. An excellent introduction into the Naval Rules of AWAW. The illustrated EoP contains Counter and Map pictures as well as a smaller font. Fleet Combat Maurice Buttazoni Very small Fleet only (no air) example of play. Japanese Attack Planner [Word, PDF] (10-13-08) Mike Crowe The Japanese Attack Planner is an aid to help plan out the initial turns of the Japanese attack on the Britain and the U.S.
Battle of the Atlantic Record Sheet (05-25-05) Bruce Harper Here is a detailed Record Log for the Battle of the Atlantic. Off Board Redeployments Chart (03-01-05) Ruben Berrozpe Ruben has provided this excellent map for helping with redeployments. Global Game Tracker (06-01-04) Eric Scheulin Excel Spreadsheet for he Global game to track BRPs, Tensions, DPs, Force Pools, YSS, SW, and more. ETO Game Tracker (06-01-04) Eric Scheulin Excel Spreadsheet for the ETO scenario to track BRPs, Tensions, DPs, Force Pools, YSS, SW, and more. Research Tracker (06-01-04) Eric Scheulin Excel Spreadsheet to track Research spending and results. Research Game Record (02-26-04) Maurice Buttazoni A two page Record Track to record Game Research levels like CTLs, Air DRMs, Naval DRMs, NATs, ASW Levels, Air Defense Levels, SBPs, etc. This allows quick access during the game to important data. Fleet Combat Display (v1.1) Maurice Buttazoni Combat Display and Sequence for small to medium Naval Engagements. Mark Simonitch Combat Group Markers for numbering CGs during naval combat.